Recently released survey results from the Winter 2012 Ryan Partnership® Chicago/Mambo Sprouts® Marketing Styling Sustainability consumer apparel reinforce findings in the 2011 white paper One Green Score for One Earth. 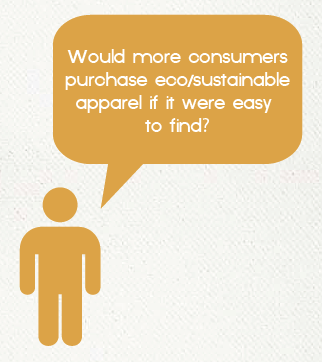 Consumers want an easy way to understand the sustainability impact of their purchases including apparel. And guess what, even in this economy, consumers will vote with their wallets for the brands that are able to convey that meaningful message while providing stylish, eco-friendly apparel. Results from the survey show that, on the face of it, buying green appears to be relatively unimportant when shopping for apparel compared to other consumer products. 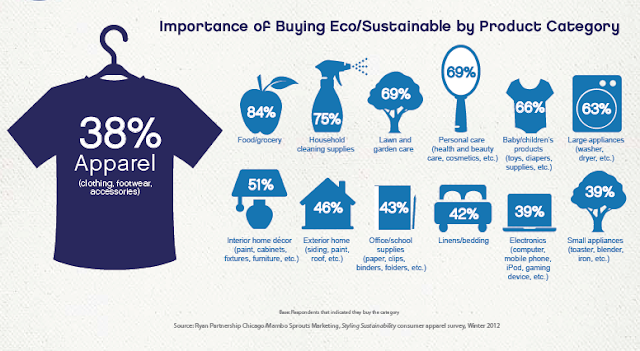 Only four in 10 consumers (38%) feel that it is important to buy eco-friendly and sustainable apparel, while three in four say that buying eco-friendly and sustainable foods and household cleaning supplies is essential (84% and 75% respectively). 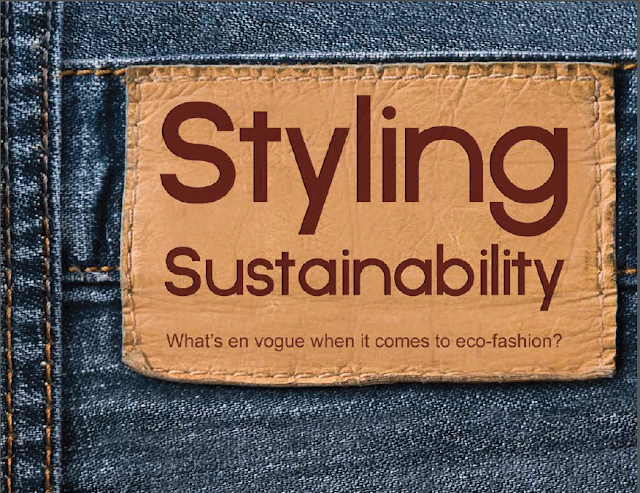 Still, the survey also showed that seven out of ten shoppers (69%) consider it's sustainability when at the point of purchase of buying apparel, while only three in ten claim they rarely (23%) or don’t ever consider (7%) it when they buy clothing. Obviously, green apparel is more important than consumers are able to express, with eco-features being part of the purchase criteria considered by many. Whether they never, rarely, sometimes or always consider eco/sustainability when purchasing apparel, shoppers become aware of green fashion choices primarily at the point-of-sale either on apparel tags (57%) or in-store signage and information (37%). To push sales of eco apparel to consumers, just as the food and cleaning supply sectors have, eco fashion retailers need to clearly get the message out to consumers as to why the purchase of their eco-friendly lines matter. Shoppers reported in the survey that a rating system or index could aid in alleviating the eco-apparel information void. Currently there is no industry standard that exists like the USDA Organic label placed on milk to help guide shoppers. The survey authors suggest that, until the time that an eco-label exists, making eco-apparel as easy to find as possible is what will drive industry growth. Check out our February Fan Giveaway to win some hot, eco-fashion for yourself!! it's the accessories that are stealing the show, proving that simple and bland outfits can easily be transformed into eye-openers or more on-trend looks with some of this summers coolest accessories.